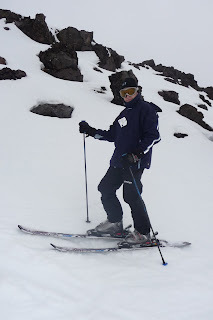 Rob and I have just spent a week in Tongariro National Park skiing on Mt Ruapehu. This is sitting on the Whakapapa ski field looking over to Mt Ngauruhoe. You can see the cloud we're above. It was very beautiful. We could also see the mountain on the west coast Mt Egmont. Here I am celebrating getting down the hill without falling over. I'm not a very good skier in poor visibility which unfortunately most of the time during our holiday. This day was quite nice. By the end of most days I hurt everywhere and the stairs up to our room seemed 10 times higher. Thank goodness for the hot spa! Rob's a great skier, he went up to some of the scary slopes for a little bit of fun. Our last day was just awesome. We managed to get to some new snow up the top of the mountain.